In addition to the vitamin A and fiber it supplies in abundance, broccoli contains an unusual compound -- sulforaphane -- that may reduce your risk of certain types of cancer, lower your cholesterol and combat ulcer-causing Helicobacter pylori bacteria in your digestive system. Broccoli extract may come either from adult plants or from sulforaphane-rich broccoli sprouts. Researchers are still investigating the properties of sulforaphane in broccoli extract, but early results are promising. The journal "Cancer Research" reported in 2008 that concentrated extract from broccoli sprouts halved the incidence of bladder tumors in an animal study. The University of Michigan's Comprehensive Cancer Center found in 2010 that sulforaphane from broccoli extract "killed the cancer stem cells and prevented new tumors from growing" in cell cultures and in animal tests. While the research on broccoli extract's anti-cancer properties is not yet conclusive, it's possible that sulforaphane could give doctors a new weapon in the fight on bladder and breast cancer. Broccoli extract cannot replace regular screening and treatment for cancer; it's vital to maintain your doctor's recommended schedule for screenings. If the report to the Proceedings of the National Academy of Sciences from Johns Hopkins researchers is any indication, then sulforaphane may help prevent skin damage, including skin cancers, resulting from ultraviolet radiation. Topical applications of broccoli extract to animals and to human volunteers caused skin cells to step up production of enzymes that help the cells combat the damaging effects of solar radiation. Unlike sunscreens, broccoli extract appears to encourage your body's own defense system's function. However, the participants in the experiment showed a large variation in the degree of protection they got from the extract, so traditional sunscreens remain your safest choice for sun protection. 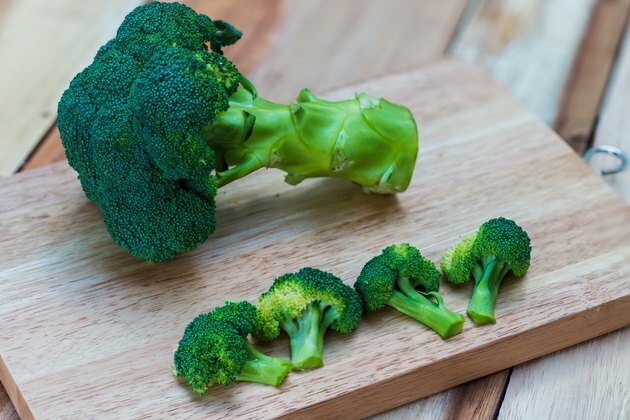 Other compounds in broccoli extract may affect blood cholesterol levels, according to research from the Monterrey Institute of Technology in Mexico. The study, published in the "Journal of Agricultural and Food Chemistry" in 2011, tested hamsters with high LDL cholesterol levels before and after a course of broccoli extract treatments. The animals showed lower cholesterol levels. Animal studies do not always correspond to similar benefits for humans, so researchers don't yet know if human participants will also enjoy lower cholesterol levels on broccoli extract. However, eating broccoli can contribute to lower "bad" cholesterol levels thanks to the plant's fiber content. Journal of Agricultural and Food Chemistry; Broccoli ( Brassica Oleracea Var. Italica) Sprouts and Extracts Rich in Glucosinolates and Isothiocyanates Affect Cholesterol Metabolism and Genes Involved in Lipid Homeostasis in Hamsters; L.N. Rodriguez-Cantu, et al. BBC News: Baby Broccoli "Controls Gut Bug"